Hello, Valentine! I have a treat for you today! This garment is one of my most favorites to date. It is red and pink and lacy and velvet and super cute. 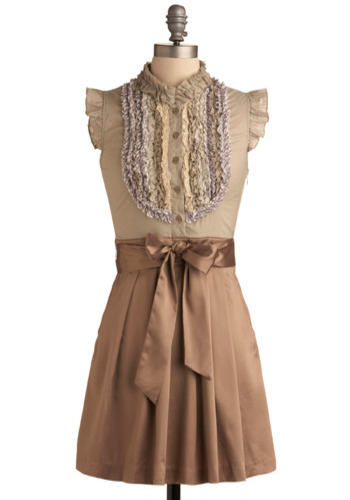 My inspiration mainly came from this dress on ModCloth. I thought the ruffled bib was a bit too much, but in that cute sorta way. Constructing a ruffled bib in ribbons and lace reminds me of a candy box, which is perfect for Valentine's Day. So, I pulled out my red velvet and looked for a simple dress to compliment all that bibbage...bibbage? I chose to try out the Coffee Date Dress. I had never made one so thought it would be a good time to try it out, not to mention, it's free! I found the pattern to be super simple, even with cutting my own seam allowance. I made some modifications in that I chose to make the skirt a bit fuller, keeping the waist the same size and adding the bib. I also finished the bottom with a blind hem since I was using velvet. I was a bit apprehensive, but Kathleen has this amazing video tutorial that really helped me out. The only problem I had was that it came out too big. Not a problem with the pattern mind you, because the muslin fit just fine. It was the fact that I decided to eat quinoa salad and quinoa and eggs for the better part of two weeks not realizing the effect it would have on my waistline! This was also the first time I sewed a garment with velvet. The seams went together rather nicely as when you press the velvet together, the pile will sorta glue itself together, no pinning needed. The most difficult time I had was with the zipper! I had to take one side out three times. I realized I was sewing in the opposite direction that the velvet wanted to lay, hence pushing my zipper in all sorts of wrong directions. Finally, the velvet, the zipper and I had a long talk and all was right in the end....except for the sizing! So, that's where I offer you this fabulous dress! Would you like to wear this out with your beloved on Valentine's Day? Even if you don't celebrate it, or are the kind of gal who wears her wedding ring on her right hand sporting independence, you could sit home with a tub of Ben and Jerry's as beautiful as can be! I made the dress ad a Burda Size 36 (US 4). However, I feel as though the sizing runs a bit big and this dress would fit a 4-6 and probably some 8s. To enter, go to my blog, Sweetie Pie Bakery, and look for the giveaway post! I put a tutorial up on BurdaStyle so go have a look! Thanks for your post, Jessi! Have fun with Valentine's Day preparations, readers... I haven't done a thing yet for it, myself! Luckily Jessi of Sweetie Pie Bakery is a little more prepared! What are you doing this year? So pretty dress! Very nice! I LOVE that dress! I especially love the bib action! You've inspired me to do some bib action too! Thanks! The dress looks amazing , i love velvet and its texture. The vibrant colour is equally gorgeous as the design.